We suggest you read the ratings & comments given by our former clients. 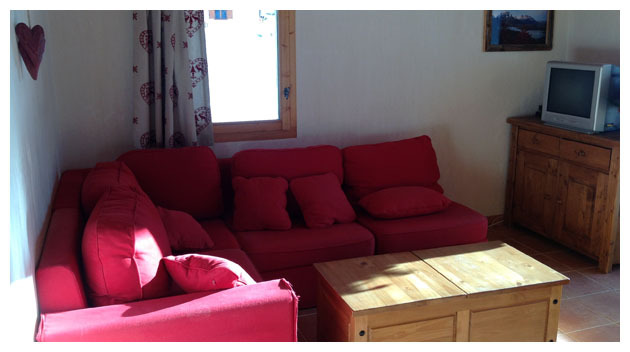 Four-star extremely comfortable apartment set in brand new chalet. 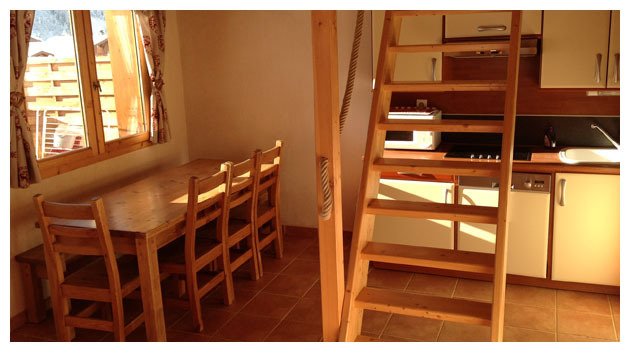 Ideally situated at the foot of the ski slopes, quiet environment, near the centre, 150 m2 lawn. 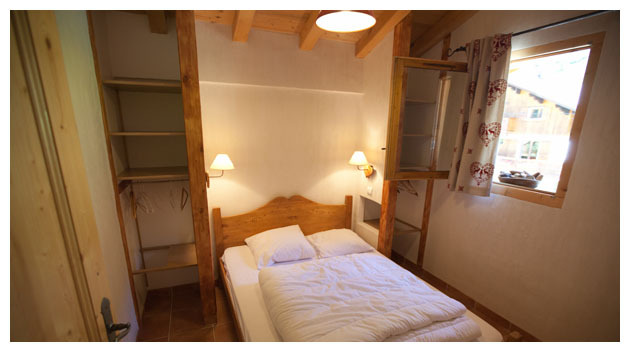 Balcony, terrace, ski store room and ski boot drying system, private parking. Both apartments sleep 6 to 8 people. All beds are fitted with mattress protectors, duvets, pillow and pillow protectors. Please note sheets, duvet covers and pillow cases are compulsory but are not furnished. Living room with corner sofa leading onto south-facing balcony. Amenities : television set, DVD player, WIFI. 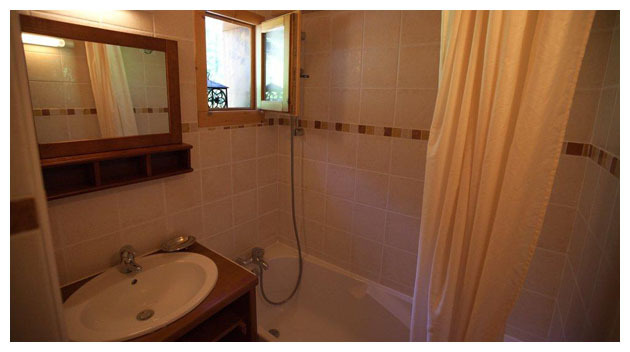 One shower room & toilet. Washing machine, tumble dryer. One bathroom with actual bathtub. Extra separate toilet. One sleeping room with standard double bed. One sleeping room equipped with to single beds. 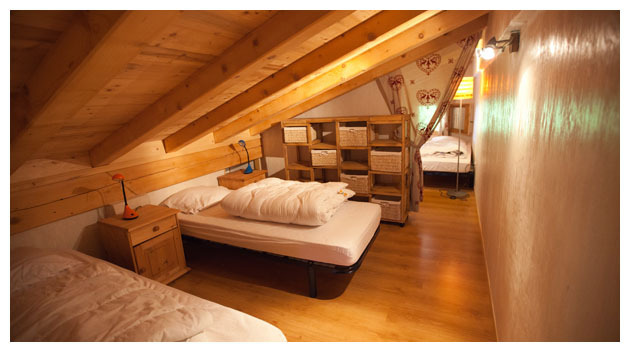 The mezzanine offers another 2 sleeping rooms each with two smaller single beds. Childcare articles may be rented, as well as sheets and towels. 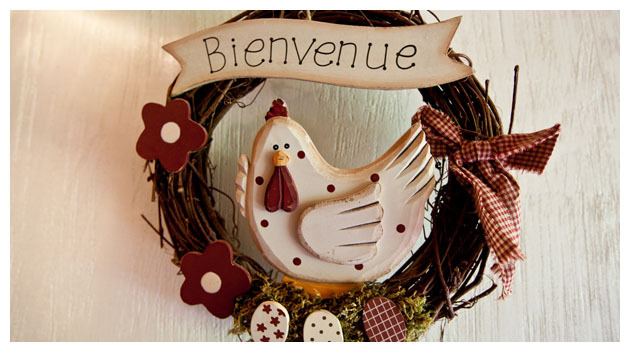 As a free added service we can provide you with a raclette or fondue device. You are automatically entitled to a 15% rebate on ski rental with our partner ski shop “Latitude” situated in the centre of the village. The rebate goes down to 10 % as from week n° 2. We charge an 80-euro set fee for cleaning at the end of your stay. We are situated in the Barioz hamlet, near the centre of the village. Shops and all facilities are within a 200 m radius meaning they are readily accessible on foot. Pralognan’s main street starts 50 meters from the chalet, with a Tourist Information Centre, post office, two different banks, nursery facility, ski school offices, cinema, stationary & newspaper shop, bakery, grocery store and many other shops, boutiques, bars and restaurants. Our chalet is only 100 m from the slopes and from the cross country skiing area, making it actually possible to go back to the chalet without taking off your skis. Meeting area for ski lessons is 50 m away. Secure toboggan runs are at your disposal right across the street. A “via ferrata” and the Bieux rock climbing area are 5 min away by foot. Several hiking trails start at the bottom of the chalet. The Olympic complex is equally near. Highway A43 to Albertville, then fast lane all the way to Moûtiers. D 915 between Moûtiers and Pralognan la Vanoise : 26 km. Traffic may get very dense on Saturdays during February and March. We strongly advise you to make sure to get to Albertville before 8 A.M. or after 4 P.M.
You may want to listen to radio stations such as France Info (105.5) and France Bleu (103.9 FM ) in Savoie. Train station « Moûtiers-Salins » (26 km away from Pralognan). Directs trains to all main destinations (TGV from Paris and Lille). Frequent Bus service between Moûtiers station and Pralognan la Vanoise.